To which you can only wonder what he plans to kick it with. Solid gold boots would be too soft. How about goethite, a material found in the mouths of limpets? Sure millions of the creatures would have to die to enable Benzema to work on his ball skills but it’s surely what they would have wanted. If Real Madrid striker Karim Benzema makes his much-speculated move to English Premier League giants Arsenal, he could bring with him his new prized possession, a $340,000 soccer ball. 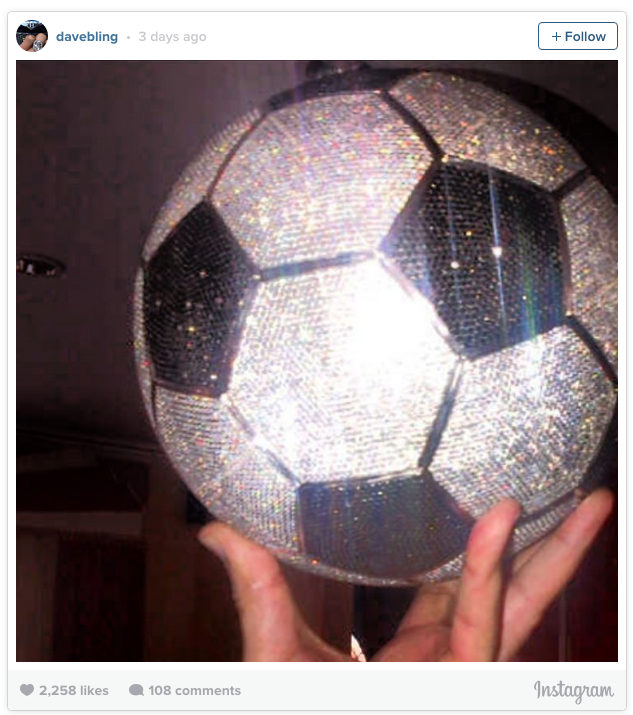 The 27-year-old French goal-scorer, who has been on the Gunners’ hit-list for months, reportedly purchased the 1,250 carat ball encrusted with 72,000 diamonds from a celebrity jeweller. Fair enough. It’s his money. We only hope he writes his name on it lest it get muddled up with everyone else’s when he check into the Emirates. Update: Every paper says Benzema has agreed to join Arsenal for £45m.